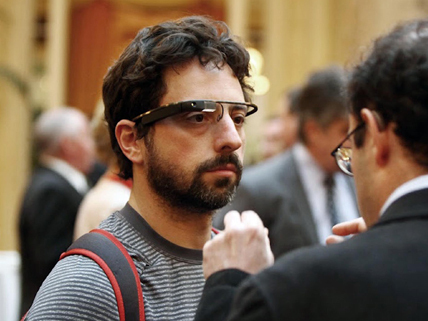 Google cofounder Sergey Brin being fitted with a Project Glass prototype headset. If you thought HMD stood for “Holt McDougal”—well, you’re right; but make way for the head-mounted display. Project Glass is Google’s cutting-edge effort to create a wearable augmented reality (AR) headset, through which you see not only what’s before your eyes but what’s in the wireless ether around you. The technology would become practically a part of you, in the way glasses are, with all the apps that work on a smartphone or tablet at your voice command. Need a weather report, a calendar reminder, or a walking map to your destination? Want to talk or video chat with a friend, make an impulse purchase, or photograph whatever you see? It’s as easy as walking around engrossed in a headphone bubble—and easier than staring down at a smartphone screen. Soon, you’ll be able to cocoon your way through life tethered to the Internet via the “glasses” on your head. OK, it’s just a prototype; it’s not yet at a store near you. But once the accountants settle on a price point, the designers devise an appropriately stylish look, and the engineers solve all the software challenges, it will be. What consequences would the widespread adoption of such a technology have? The kind of everyday existence into which this device is designed to fit raises questions about the nature of human individuality in community. Columnist Ross Douthat, reacting to Google’s Project Glass promo video, points to how it “captures the sense of isolation that coexists with our technological mastery.” In his view, “the Man with the Google Glasses” epitomizes “modernity’s mix of achievement and alienation.” This take echoes sociologist Sherry Turkle’s Alone Together (2011), which suggests that the possibility of genuine human connection, not to mention solitude, is threatened by the lure of virtual relationships, which despite their immediacy and accessibility, tend to be superficial. Culture columnist Ross Douthat brings a healthy dose of reality to his analysis of Google’s latest technological marvel. Project Glass is still not even in its beta-testing phase, but it’s creating a lot of buzz. Learn more about the technical aspects of Google’s Project Glass here. Visit the official website of Sherry Turkle’s 2011 book for thoughts on the sociological downside of social networking gadgetry. Its subtitle says it all: Why we expect more from technology and less from each other. They’ll hack our brains and steal our cheese!! AHHHH! Wow that’s awesome but it would cost a lot and I would rather buy a normal phone.